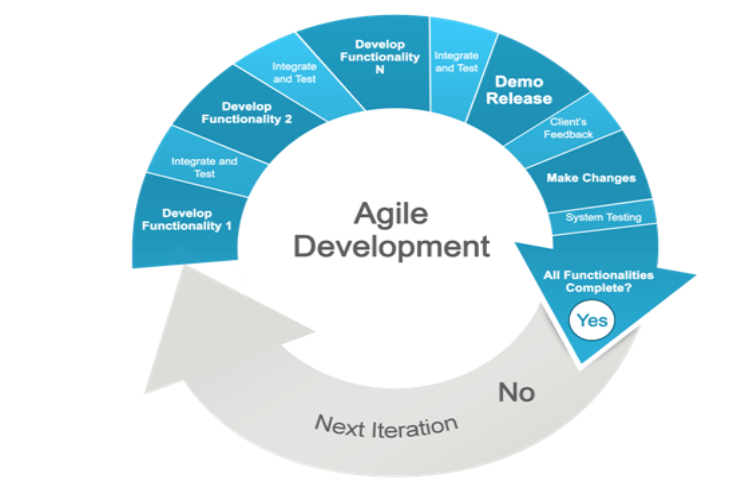 Agile software development is an iterative based software development method where the software solution is built in incremental versions from the start of the project instead of delivering at the end all at once. The agile process facilitates us to deliver high-quality software products in a short span of time by encouraging frequent testing & adapting to the issues faced at each iteration, instead of waiting till the end of the project and having costly time delays. Scrum is the most widely used and lightweight framework for agile development. Scrum process helps organizations to adjust to rapidly-changing requirements and develop a product which meets the client requirements or company goals at the same time increasing productivity. The incremental nature of agile methods builds in more flexibility than the old-fashioned “waterfall”. In the agile development process, we will divide development tasks into small, manageable units, and track progress with regularly scheduled meetings of all players including product owners. By using abbreviated work cycles agile process helps to identify problems at their initial stages and help us solve it faster. The series of “sprint cycles” in agile development process helps us to continually revisit a lot of factors like technical requirements, design and so forth, throughout the lifecycle of the projects when a team re-evaluates the direction of a project once a week or so. This helps you to catch problems and make changes to get back on track before significant time and resources are spent. Our agile development process lifecycle. At start Scrum can be intimidating, our experts will help your team through these first initial steps to organize teams internal process based on their values and goals and get them started for the regular sprint. As scrum consultants, we look to engage in high-level discussion about how Agile methods can improve your product and service delivery and how you can achieve broader strategic goals. Our experts provide agile support to help your team so they become self-sufficient to launch or scale your Scrum implementation.